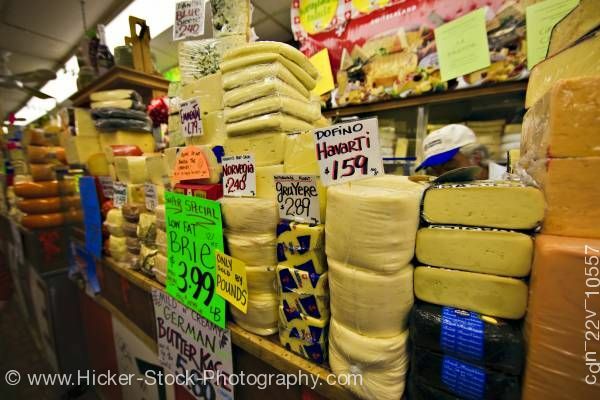 Stock photo of a wall of cheeses piled high inside a shop at Kensington Market in downtown Toronto, Ontario, Canada. This stock photo brings you inside a cheese shop at Kensington Market in the city of Toronto. A man in a white hat peers out between dozens of neatly stacked blocks of a variety of cheeses which cover the counter top below and the shelves above. Some of the cheeses are wrapped in black and blue, there is a neon-green colored price sign mid-frame, and the streak of white that is the fluorescent light ceiling fixture trails off into infinity in line with the all the huge slabs of cheese.